The trade deadline has come and gone and some players that could affect teams were moved. One notable one is now-Pistons forward Tobias Harris. But after that, is the season where veteran players get to pick the team they want to go to. Yep, buyout season is upon us now and after the trade deadline is usually when it happens. Of course, some players get traded and get bought out with no one to pick them up. But there are some that are coveted but not coveted at the pricetag they were being paid at. 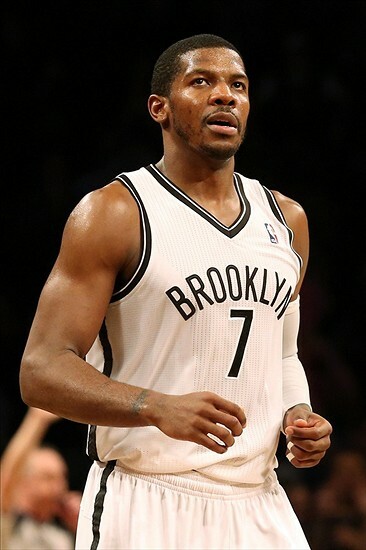 Joe Johnson was getting paid 21.9 million this season for the Brooklyn Nets. Plenty of teams were interested in him, but the pricetag was just too high for them. Many teams were hoping instead of trading for him, that the Nets would reach a buyout with him eventually. It may not have happened when many expected it to, but now Joe Johnson is a free agent on the open market. The Nets and Johnson agreed to a buyout of his contract on Thursday. And assuming he will clear waivers, Johnson will be able to pick where he wants to go. More than likely, a contender will take a chance and bring him in for the rest of the season and the playoffs. But the question is which team will he choose? The answer to that question is still up in the air, but here are the three teams (in no particular order) that are expected to make a run at the 34 year old veteran. The Cleveland Cavaliers have been better under the leadership of Tyronn Lue. The teams seems to be more in tune defensively and Kevin Love is more involved offensively. Even with some of the struggles that they have had this season, they are still the best team in the NBA’s Eastern Conference. But even with that, there seems to be an issue with the shooting they have coming in off the bench. Channing Frye was acquired to add to the shooting off the Cleveland bench, but anytime you have Richard Jefferson coming in off your bench to backup LeBron James, then there is an issue. Johnson is not a small forward, but at 6’7”, he can play the small forward position. He and Iman Shumpert coming in off the bench would be a solid duo because they both have length and size defensively and offensively Joe could balance out the inconsistent shooting that comes from Shumpert and some of the backup guards. Johnson would be a shot in the arm for the backup crew in Cleveland and could also run with starting crew sometimes with LeBron James. And with LeBron’s propensity to break down defenses, Johnson could spot up and nail the three (Johnson is a career 37% three-point shooter). He essentially would help create even more lanes and space for LeBron, especially if they go to the small lineup with LeBron at the power forward position. And more importantly for Johnson, he could play on a team that could potentially get him to the NBA Finals for the first time. Johnson could definitely help the Cavaliers’ bench, but he could also help the Thunder whether it be off the bench or in the starting lineup. The Thunder have been carried all season long by their superstars, Kevin Durant and Russell Westbrook. But what they have had all season is a hole at their shooting guard spot. They filled it earlier in the season with Andre Roberson. The young wing player is in the mold of former Thunder guard Thabo Sefolosha in that he is a defensive player and can spot up offensively and can occasionally hit the open shot. But in a playoff series, he helps other teams play four on five. His offensive game is not respected and that causes things to be harder for Durant and Westbrook in crunch time. The other shooting guard the Thunder have is Dion Waiters. The young guard out of Syracuse has been inconsistent at best for his entire career and you never know what you will get out of him, whether it be off the bench or starting. Johnson would give them a career 17 point per game scorer that is feared scoring the ball and could help some of the playmaking pressures off Durant and Westbrook in the playoffs. If he decides to go with that team, that gives them a veteran presence that could conceivably give them enough to challenge for the Western Conference crown. Johnson would be heading West, but there is another team that should take a look at him. That team: the San Antonio Spurs. Many will probably wonder why he would fit that team. They are pretty deep as it stands right now. But Joe would fit in seamlessly on that team. Manu Ginobli will be back momentarily with this team and they have the energetic Jonathan Simmons coming in off the bench as well. But Johnson adds something that they miss when they look down the bench. Johnson can play the small forward position off the bench in San Antonio and give them some much-needed shooting there. And he can also play the backup shooting guard position as well if Ginobli does not make it back like they expect him to. There will not be huge minutes for Johnson to be had there, but he would be on one of the best teams in the West and a team that some think can knock off the Golden State Warriors. Having a guy like this coming in off your bench is never back for a team that covets guys that can shoot and move the basketball. Joe can become a Black Hole at times with the ball, but I’m sure he could adapt to the play in San Antonio pretty easy. This decision for Joe Johnson is a huge one for him. It could be the difference between winning a title and going home earlier than expected. Johnson may not have this type of opportunity again in his career, so he may want to examine his fit to each team before making his choice. He brings some good things to all three of these teams and it will be interesting to see which one he chooses, whether it be one of these three or another wildcard team. So anyone now wanting Joe Johnson will have to undertake his almost $25 million salary . All this, for a player who contributed little by way of leadership or productivity to the Nets over the past two seasons . I coulda’ been contender LOL,LOL !!! Actually, they won’t have to pay Joe but the vet minimum for the rest of the season. He actually has averaged 17 points per game his whole career. I think I would take that spot-starting or coming off my bench.